Dim Sum Haus on Jalan Besar is a new addition to the vast number of eateries and hawker grub along this strip. I was excited to see this fancy looking Dim Sum joint open its doors so close to my home and whenever I walked by on a weekend I had observed queues of people waiting to eat here. 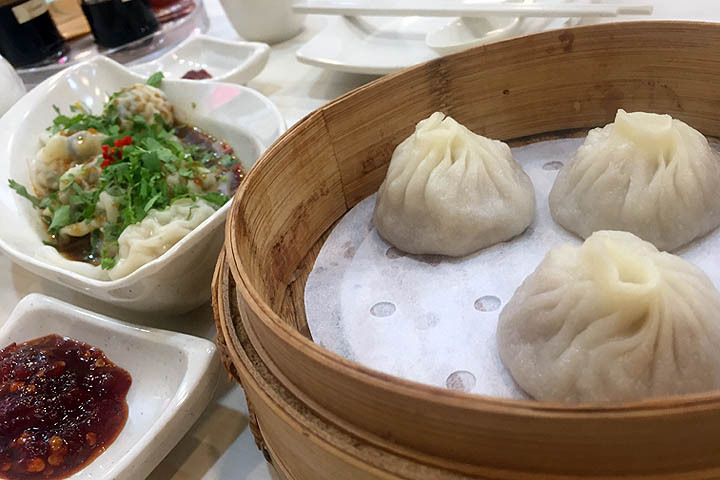 So one weekend I finally made it to Dim Sum Haus ahead of the lunchtime rush but was disappointed to eat the same old dumplings but only of lesser quality. Let me start with some positives. Dim Sum Haus is newly built and modernly furnished. It is a pleasant place to sit with its brand new furniture and air conditioning turned up high. The staff are neatly decked out in swish red uniforms bearing the Dim Sum Haus logo. The whole look and feel is very professional. However the place is lacking in soul. 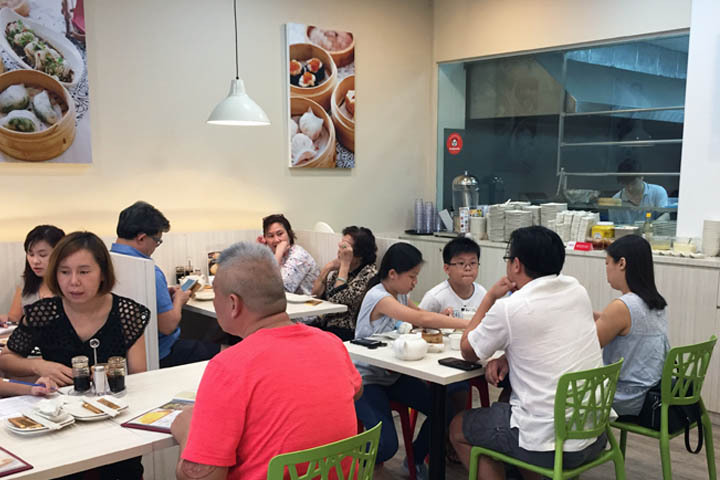 At Dim Sum Haus on Jalan Besar you can barely see the chefs at work, as they are tucked away at the back corner of the restaurant. The waitstaff are focused on turning tables quickly and there is no pride in the way they serve the food. More importantly, I was disappointed in the taste of the food. The menu contained beautiful photography of the various meals, however it is simply a rip off of what Swee Choon serves down the road with one or two variations. To start with we ordered a portion of soup dumplings (xiao long bao), which came with only three dumplings in the steamer. They were a little on the dry side as I could taste the flour in the dough. Whilst the dumplings were sufficiently soupy on the inside, the pork was not succulent enough and needed more salt. The Japanese dumplings came five per portion. The dough was not as silky soft as it should be and it tasted doughy and dry, particularly around the folds at the top. The encased pork was not juicy or sufficiently seasoned either. Although the dumplings were served with soy sauce and a few small pieces of fresh chilli, the dish as a whole tasted bland. Next came the steamed pork rib with yam, which was served in a shallow bowl. By this time we had come to realise that Dim Sum Haus on Jalan Besar simply cannot do pork very well. The cut of pork used was very fatty (more so than usual, given the rib is a fattier cut) and without any detectable salt, herbs or spices to enhance the taste. The fatty pieces of steamed pork were only made edible by adding generous lashings of the complimentary chilli sauce on the table. One of the signature dishes of Dim Sum Haus on Jalan Besar are the charcoal chicken and prawn dumplings. 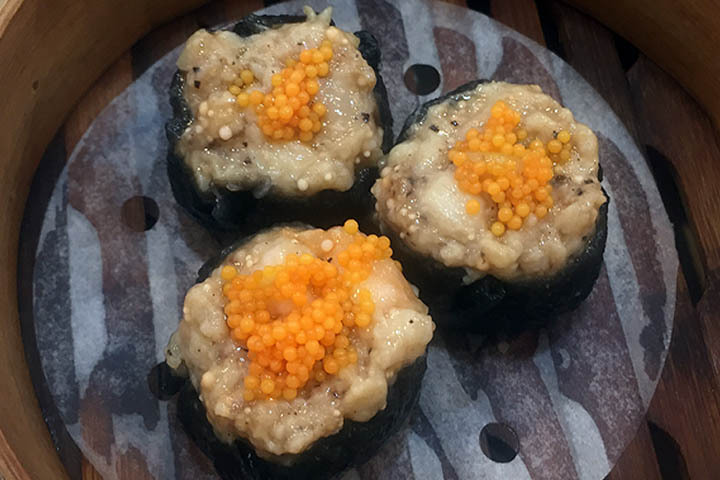 These dim sum look very appetising with dark grey wanton wrappers contrasted by a bright orange roe garnish. However you only need to bite into it to realise they are mostly unseasoned chicken. I could barely detect any prawn or flavour! The pan-fried mushroom buns were the highlight of our meal and one of the few unique offerings on the menu. 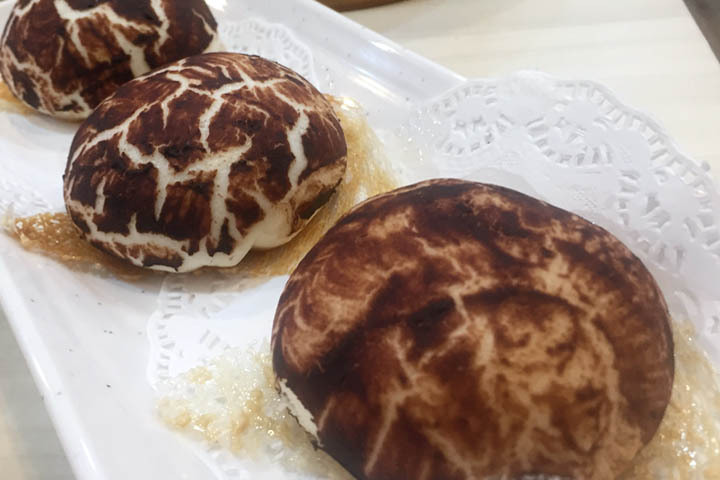 These white buns come decorated with dark brown glaze and feel soft and springy to touch. Inside is a delicious although modest filling of mixed pan fried mushroom. To finish our meal we ordered a plate of the baked BBQ pork pastries. It was the final disappointment. Whilst the pastry was baked perfectly to a golden and flakey consistency, inside was pure mush containing very tiny squares of red BBQ meat with more sauce than substance. Dim Sum Haus on Jalan Besar may have nice air conditioned premises and professional photography showcasing their menu. However their food is not up to scratch. 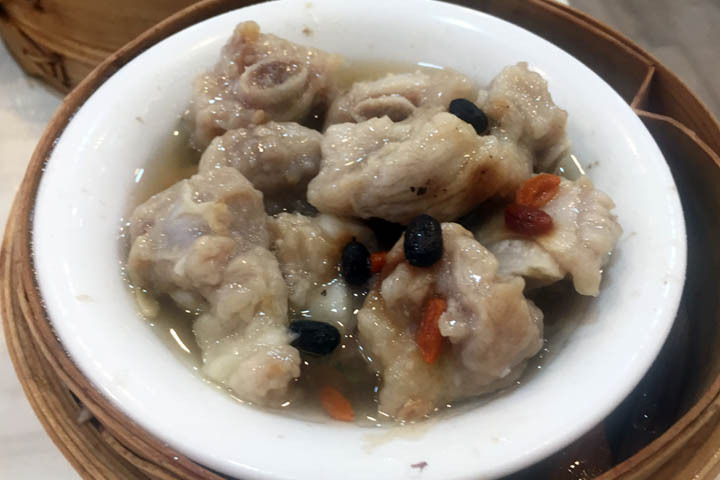 The majority of dishes tasted bland and lacked something difficult to describe, perhaps it is flavour or freshness, or perhaps it is pride and tradition? However whatever that missing ingredient might be, Dim Sum Haus has a long way to go. I would prefer to eat dumplings at the more humble Swee Choon or Victor’s Kitchen any day.